The Church of St. Nicola of Bari: it is today the parish church in Tortoreto Alto. It was founded before 1000 and rebuilt in 1534. The apse is decorated with a triptych by Marcello Liberati, representing Christ Crucified in the middle, Our Lady of Sorrows on the right and St. John the Evangelist on the left. A silver statue of the Madonna of the Snow is also kept inside. St. Augustine’s Church: it was originally connected withthe Augustinian monastery whose foundation dates back to the end of the XV century. The inside of the Church is with a single asle and the wooden altars are in Baroque style. The polycrome stattue of the Madonna with the INfant Jasus deserves to be mentioned, as it is typical of the iconography of Abruzzo. But the most valuable work is by all means the great painting by Mattia Preti (1613 – 1699), wich represents St.Augustine’s Baptism. 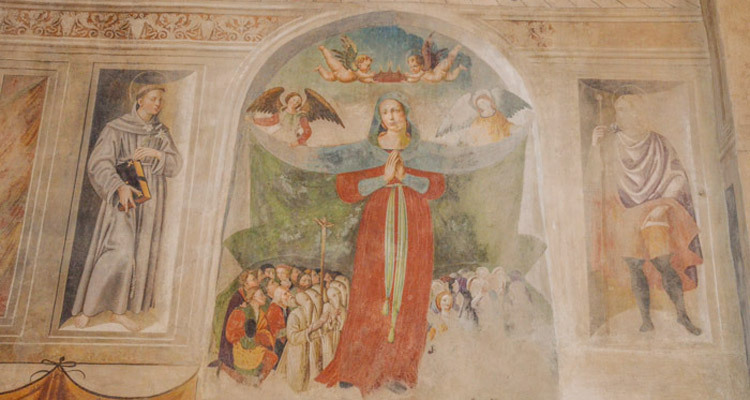 The picture is for the present at the National Museum in L’Aquila, where it is being restored. Our Lady of Mercy’s Church: it was built in 1348 in honour of the Virgin of Mercy who preserved the town from a terrible pestilence. The single aisle is devided into two cross-vaulted spans and connected with the spacious apse. Parts of the frescos are completely damaged because of the negligence of men; a careful restoration, however, has put back the remainder into its original chromatic splendour. The Watchtower: it was built in 1881 above that of the draw-bridge and of which it has kept some traces in the lower part the tower is characterized by four pointed arches. The Archeological Site – Villa of Roman Epoch: it’s among the most ancient archaelogic remains. IN this area, the Roman Villa is worth remembering. It is situated next to the cross-roads to Tortoreto Alto, in Muracche town district. The villa, which goes back to the pre-imperial period, has been recently discovered. Town Building: It was built on the XVIII century, De Fabritiis Family owns it, and today it hosts the Commune of Tortoreto. 1914 it became concentration camp for Jewish prisoners. After the war it bacame the center of local policemen and from 1979 center of the Commune of Tortoreto. The Fortellezza with the wonderful sight: If you leave the suburb and go east, you’ll arrive to a natural terrace, once upon a time a military outpost, that leans on the adriatic coast, wher you can gather an exciting panorama: you can embrace witha look the whole coas line from Tronto to Tordino river, everything framed by the mighty montanious background. Assumed Lady’s Church: Pretty private church, set in 1839 by De Fabritiis Family. You can see it, while you walk along via Carducci, turning into via Giovanni XXIII, to go to the new church. Springs of Vascello: When you go down the northern slope of Tortoreto Alto hill, you’ll find the springs of the Vascello Valley. It a zone rich in water-polls, named Fontanelle, and there was the ancient fountain with washtable. The cave continue its route and arrives to the sea. The Siren: Realized in bronze in 1982, on the artistic foundry Battaglia in Milan, on a sketch of the artist Gabriella Martini from Tortoreto. It was initially situated on a mountain of rocks in via Trieste and after a few years removed. In 2003 a fountain has been realized, to the beginning of the seaside, for a best and definitive setup of the statue. Monument to the Fisherman: “sciacqua, sciaborda/ scroscia, schiocca, schianta/romba, ride, canta/accorda, discorda/tutte accoglie e fonde/ le dissonanze acute/ nelle sue volute/ profonde/ libera e bella,/ numerosa e folle,/possente e molle,/creatura viva/ che gode/ del suo mistero/fugace” (L’Onda – G.D’Annunzio) Stone monument on the Lungomare, near to via Alighieri, set to memory of Fishermen lost into the sea.